For anyone who has ever seen the Rockies they know how absolutely breathtaking that landscape is. Someday I hope to get to travel the world to see and experience what it has to offer, but I know without a doubt the Rockies will always be a special place for me. I still remember the first time seeing the Rockies as a young boy, in a split second I was in absolute awe with that amazing feeling you get when something truly beautiful tugs at your heart. I had been traveling with a friend's family to Jasper National Park in their van and had been dozing in and out of sleep. I remember waking up and taking a look out into the night sky and seeing the silhouette of the Rockies all around us. It was such a feeling! I had never seen anything like those mountains in my life and it forever changed me. Over the years past I've been back time and and time again and realize that I'm quite blessed to be only a four hour drive away from the mountains. Over this past Sunday I went back to Jasper on a day trip which was so long overdue. On our way into the town of Jasper we came across a few cow elk crazing along the road. Out of pure luck we came across them right when the clouds had just parted and the sun was shinning down. I wish I could have stayed a bit longer but after almost four hours of driving, and all of us having a hungry stomach I figured the best course of action was to head into town before the girlfriend became a grumpy pants. Once stomachs had been filled (if you are of the vegan or vegetarian variety as the two I was traveling with were... I highly recommend Coco's Cafe for a delicious breakfast) we decided to head for the Valley of the Five Lakes for our first hike of the day. The trail was a great one to get back into the hiking season. The Five lakes loop is about 9km and there isn't a whole lot of steep elevation change but the view's are incredible as the trail pokes you in and out of tree cover. There was one point nearing the end of the loop where I was looking down into the valley thinking to myself "It sure would be nice to see something other then another squirrel" When I just happened to look over my shoulder and see a deer just strolling right past us. So right away my only only thought was I needed to get closer, and from there according to my girlfriend and our other hiking companion I began to look like a complete idiot... Imagine a cartoon character right out of Loony Toons trying to sneak up on someone, you know that that long awkward half crouch and extending leg step? Yep, well that was me. I may have looked like Wiley Coyote sneaking up on the road runner right before a anvil fell on his head but I did manage to get pretty dang close and was able to snap a few photos. My sneakiness soon wore off and the deer disappeared into the woods as we made our way back to the car. After the Valley of the Five Lakes we headed out and Old Fort Point was next on our list.Old Fort has been a favorite of mine, it may be a busy trail but that's probably because it's so close to the town site and it offers such an amazing view after only a short hike up. And the Sheep! Oh my so many sheep! 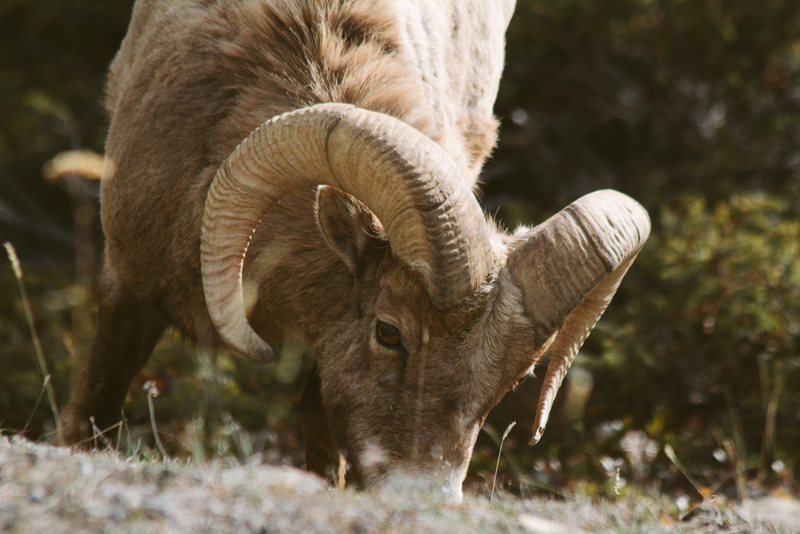 Other then a cute little chipmunk which paused just long enough to get a couple of quick shots of before it was off scurrying again I spent my time with the big horn sheep. I remember our "domesticated" sheep we had growing up and I will tell you these wild mountain sheep were 3000x less skidish around people then our flock we had back home. Being around so many hikers and other tourists everyday has made these sheep very less "sheepish" which allows you to get remarkably close without so much as a bothered glance from one of them. I could have probably walked right up and stood only meter away if I wanted to, but with any wild animal you always show your respect and do you're very best not to disturb them. But that being said it was absolutely amazing! I would just sit down with my camera and snap away with my shots as they would walk towards me grazing. It was quite an experience to be so close to such a beautiful animal. I hope to go back in mid May which I believe is their lambing season and just spend a day following them, and again during the fall during their rut.